Exactly 100 years ago December 17, an explorer found glory upon the Antarctic continent. One month later, his rival met a bitter, sad end. Yet, both share lessons in the power of innovation built on best practices – and the pitfalls borne of haste and poor planning. Today, for those looking for rationales behind the need for innovation in pursuit of excellence, the race to the South Pole offers both cautionary tales and textbook examples of success and failure surrounding the innovation process for any business or mission. Norwegian Roald Amundsen and Englishman Robert Falcon Scott shared a dream of being first to the South Pole. Though they both were able and famed explorers of their day, their tales revealed the power of intensive research, planning and best practices. Yet where Scott decided to innovate on what he believed to be an ideal course of action, Amundsen – who, five years earlier, pioneered the Arctic’s Northwest Passage from the Atlantic to the Pacific – studied best practices of a culture half a word from his destination. In September, National Geographic marked the centennial of their explorations . Their examples of innovation range from the fine details to the mundane. Scott’s provisions, supplies and transport included 19 horses, 33 dogs as back-up, traditional wide-body sleds, and woolen clothing – all suited, or so he thought, to wintry exploration. To the contrary, each introduced inherent risk of failure. Horses’ hooves were ill-suited to trodding across snow and ice, which led to exhaustion in the harsh conditions. The wide sleds bogged down. Woolen wear soaked up human perspiration, which then froze to ice. Amundsen, on the other hand, invested more than a year planning his journey. He painstakingly researched life lived in extreme conditions. He lived with Eskimos and modeled his outerwear on the furs they wore. He innovated upon modern sleds by making them longer and narrower so as to spread their weight across a greater length. Knowing extreme conditions likely would lead to attrition of his dog teams, he brought 53 sled dogs. For mooring, he chose the Bay of Wales, or Ross Ice Shelf. Stationary for 80 years, it would provide the best shelter for his ship and base camp from strong winds. He built and provisioned three camps along the route. This way, his team would be lightened from carrying provisions the entire route. It’s a practice used by many explorers to this day. On December 17, 1911, Amundsen made it to – and a month later returned safely from – the South Pole. 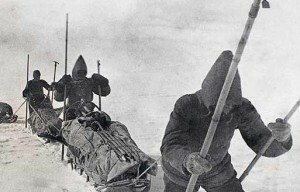 A month later, Scott arrived at the Pole, only to find Amundsen had beaten him there. With his horses having perished or been shot along the route, Scott and his men began the return trek by foot. Ultimately, they, too, perished in a blizzard within miles from their own base camp. Today, Antarctica remains a hub of innovation. Engineers are designing robots to navigate amid the extreme conditions. Architects who design living quarters used by scientists on the continent constantly are developing new buildings to withstand wind speeds topping 200 miles per hours and temperatures that can drop to 40 below zero. This month, a three-man team from Thomson Reuters will drive its revolutionary Polar Vehicle – outfitted with bio-fuel, solar panels, and the latest in real-time GPS satellite communications and tracking. Staged to beat the Guinness World Record South Pole overland journey of two days, 21 hours and 21 minutes, the effort also will mark the centennial of Roald Amundsen’s achievement. For those in search of innovation’s leading edge, it would seem Antarctica remains one of its final frontiers. One hundred years ago, Roald Amundsen realized – and Robert Falcon Scott lost his life to – the poles of innovation. Where Scott pursued his own vision of innovation, Amundsen followed well-modeled best practices as an imperative of smart innovation. In the end, he proved that innovating atop best practices maximizes the strengths of both.